Brightly colored canoes amidst the tranquil setting of the Swing Bridge and Swing Bridge Cafe and Boathouse on the Erskine River in Lorne, Australia. I was running a photography class recently and a question came up about how to localize color to a very specific part of an image. Depending upon the distribution of color in the image this can be a very simple procedure in a program like Adobe Lightroom. Late afternoon light and very little breeze provided great conditions for the above image of the Swing Bridge, the Swing Bridge Cafe and Boathouse in Lorne on Victoria’s Great Ocean Road. 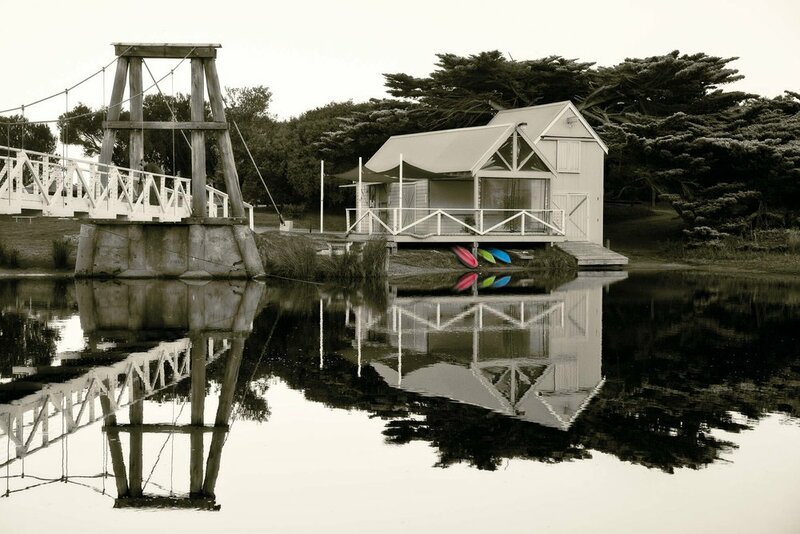 Nestled close to the shoreline, at the mouth of the Erskine River, these structures are icons associated with the township. I composed the image in such a way to make a pleasing arrangement of the various focal points (i.e., bridge, building, canoes) and their reflections. The challenge was to bring the individual elements within the scene together in a pleasing and cohesive way while keeping the image relatively uncluttered. A warm tone black and white rendering was essential to imbue the image with the feelings of calm and quiet one typically experiences at this location as the light fades and sunset gives way to twilight. I suspect that, for many Victorians, the photograph of the Swing Bridge and the Swing Bridge Cafe and Boathouse is as much about memory and nostalgia as it is about the actual bridge and buildings. That’s because photography is about much more than mere documentation. Certainly the concepts of memory and nostalgia were very much in my own mind when I processed this photo. I removed color throughout the image, except for the canoes and their reflections. A subtle green and yellow split tone was then added to further enhance the nostalgic nature of the image. You can see the same localized color technique illustrated, albeit a little more crassly, in the above candid snap made in Bali. I spotted this young couple and anticipated the amorous advances of the young guy. I was, after all, young myself once. Notice how the color red is localized to the bag worn over the young ladies shoulder. I was lucky that this was the only occurrence of red in the image. That meant the process of removing color from the rest of the photo, without effecting the red color heart on her bag, could be easily achieved in Lightroom. If the color red occurred in other parts of the image it’s usually easier to localize the appearance of that color through the use of Adjustment Layers and Masks in Photoshop. It’s a simple image, to be sure. Nonetheless, it’s an example of the power of irony and how the process of photography (including post processing) can allow you to make something out of nothing. One of the things that increases the likelihood of implementing a newly learned technique on the desktop is to choose an image that’s well suited to that particular technique. So often over the years I’ve found folks distraught at their lack of success implementing a newly discovered technique. In most cases there’s nothing wrong with what they’re doing. They’re just chosen the wrong image to do it to. While I was too far away to see their faces I could see the heart shape on the bag and recognized the irony as I saw the image forming in my mind's eye. The colors within the scene were not particularly interesting. Yet, when I removed all the colors, the image looked a little flat and not particularly interesting. But by removing all colors except for red, which existed only in the heart shape on the young ladies bag, the relationship between the heart symbol and the two young lovers is emphasized. And isn’t that what this photo is all about? A red barrier provides a splash of vibrant color in this otherwise black and white photo of Web Bridge in the Docklands precinct of Melbourne, Australia. No matter what it is you photograph it’s important to remember that, as the creator, you own that photo. Not just legally, but emotionally. It follows then that what you do on the desktop shouldn’t be governed by wanging sliders around or clicking on presets. Post processing should serve the needs of the one who crated that image. That means you! Not sure why you made the image or what you wanted to explore or express at the time you released your camera’s shutter. Fine, just look carefully at the image and let it guide you. There’s nothing wrong with that approach, as most of us work intuitively. Photograph from the gut and then, after looking and thinking about what that image communicates to you, employ post processing to realize and, in some case, extend that understanding. Please don’t underestimate the value of this process. You’ll learn a whole lot about your images and, as a consequence, yourself by studying your own photography, particularly your very best images. A bright red flower placed in the hands of a contemplative Buddha statue in Bali, Indonesia. The technique of local or spot color is easy to learn and fun to apply. If you choose well the technique can be applied on interesting images in a way that only heightens the mood explored. However, as a general rule, you wouldn’t want to use this technique too often. In fact I’ve only used it on a handful of images over the years. Of course, there are always exceptions to a rule. Nonetheless, care should be taken otherwise what looks creative, with overuse, can begin to look like a gimmick. Through overuse such techniques can look quite amateurish and trite. As in all things, moderation is advised.